^ 73.0 73.1 Wakeman 1985，第674页. Dennerline, Jerry, The Shun-chih Reign, (编) Peterson, Willard J., Cambridge History of China, Vol. 9, Part 1: The Ch'ing Dynasty to 1800（剑桥中国清代前中期史）, Cambridge: Cambridge University Press: 73–119, 2002, ISBN 0-521-24334-3 . 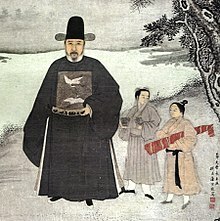 Fang, Chao-ying, Fu-lin（福临）, (编) Hummel, Arthur W., Eminent Chinese of the Ch'ing Period (1644–1912)（清代名人传略）, Washington: United States Government Printing Office: 255–59, 1943a . Struve, Lynn, The Southern Ming（南明）, (编) Frederic W. Mote, Denis Twitchett, and John King Fairbank (eds. ), Cambridge History of China, Volume 7, The Ming Dynasty, 1368–1644（剑桥中国明代史）, Cambridge: Cambridge University Press: 641–725, 1988, ISBN 0-521-24332-7 . Wakeman, Frederic, The Great Enterprise: The Manchu Reconstruction of Imperial Order in Seventeenth-Century China（洪业：清朝开国史）, Berkeley, Los Angeles, and London: University of California Press, 1985, ISBN 0-520-04804-0 . In two volumes. Bartlett, Beatrice S., Monarchs and Ministers: The Grand Council in Mid-Ch'ing China, 1723–1820（君主与大臣：清中期的军机处（1723～1820））, Berkeley and Los Angeles: University of California Press, 1991, ISBN 0-520-08645-7 . Benard, Elisabeth, The Qianlong emperor and Tibetan Buddhism, (编) Millward, James A., et al. (eds. ), New Qing Imperial History: The Making of Inner Asian Empire at Qing Chengde, London and New York: RoutledgeCurzon: 123–35, 2004, ISBN 0-415-32006-2 . Berger, Patricia, Empire of Emptiness: Buddhist Art and Political Authority in Qing China, Honolulu: University of Hawai'i Press, 2003, ISBN 0-8248-2563-2 . Chang, Chia-feng, Disease and its Impact on Politics, Diplomacy, and the Military: The Case of Smallpox and the Manchus (1613–1795), Journal of the History of Medicine and Allied Sciences, 2002, 57 (2): 177–97, PMID 11995595, doi:10.1093/jhmas/57.2.177 . Chang, Michael G., A Court on Horseback: Imperial Touring and the Construction of Qing Rule, 1680–1785, Cambridge (Mass.) and London: Harvard University Asia Center, 2007, ISBN 978-0-674-02454-0 . Chayet, Anne, Architectural wonderland: an empire of fictions, (编) Millward, James A., et al. (eds. ), New Qing Imperial History: The making of Inner Asian empire at Qing Chengde, London and New York: RoutledgeCurzon: 33–52, 2004, ISBN 0-415-32006-2 . Crossley, Pamela Kyle, A Translucent Mirror: History and Identity in Qing Imperial Ideology, Berkeley and Los Angeles: University of California Press, 1999, ISBN 0-520-21566-4 . Dai, Yingcong, The Sichuan Frontier and Tibet: Imperial Strategy in the Early Qing, Seattle and London: University of Washington Press, 2009, ISBN 978-0-295-98952-5 . Elliott, Mark C., The Manchu Way: The Eight Banners and Ethnic Identity in Late Imperial China, Stanford: Stanford University Press, 2001, ISBN 0-8047-4684-2 . Elman, Benjamin A., A Cultural History of Civil Examinations in Late Imperial China, Berkeley and Los Angeles: University of California Press, 2001, ISBN 0-520-21509-5 . Elman, Benjamin A., The Social Roles of Literati in Early to Mid-Ch'ing, (编) Peterson, Willard J. (ed. ), Cambridge History of China, Vol. 9, Part 1: The Ch'ing Dynasty to 1800, Cambridge: Cambridge University Press: 360–427, 2002, ISBN 0-521-24334-3 . Fang, Chao-ying, Šarhûda（沙尔虎达）, (编) Hummel, Arthur W. (ed. ), Eminent Chinese of the Ch'ing Period (1644–1912)（清代名人传略）, Washington: United States Government Printing Office: 632, 1943b . Finnane, Antonia, Yangzhou: A Central Place in the Qing Empire（说扬州：1550—1850年的一座中国城市）, (编) Cooke Johnson, Linda, Cities of Jiangnan in Late Imperial China, Albany, NY: SUNY Press: 117–50, 1993, ISBN 0-7914-1423-X . Gates, M. Jean; Fang, Chao-ying, Hsiao-chuang Wên Huang-hou（孝庄文皇后）, (编) Hummel, Arthur W. (ed. ), Eminent Chinese of the Ch'ing Period (1644–1912)（清代名人传略）, Washington: United States Government Printing Office: 300–1, 1943 . 宫宝利 (编), 顺治事典, 北京: 紫禁城出版社, 2010, ISBN 978-7-5134-0018-3 . Ho, Ping-ti, The Ladder of Success in Imperial China: Aspects of Social Mobility, 1368–1911（明清社会史论）, New York: Columbia University Press, 1962, ISBN 0-231-05161-1 . Hucker, Charles O., A Dictionary of Official Titles in Imperial China, Stanford: Stanford University Press, 1985, ISBN 0-8047-1193-3 . Kennedy, George A., Minggadari（明安达礼）, (编) Hummel, Arthur W. (ed. ), Eminent Chinese of the Ch'ing Period (1644–1912)（清代名人传略）, Washington: United States Government Printing Office: 576, 1943 . Kessler, Lawrence D., K'ang-hsi and the Consolidation of Ch'ing Rule, 1661–1684, Chicago and London: University of Chicago Press, 1976, ISBN 0-226-43203-3 . Kim, Kwangmin, "Saintly brokers: Uyghur Muslims, trade, and the making of Central Asia, 1696–1814", Ph.D. diss., History Department, University of California, Berkeley, 2008, ISBN 9781109101263 . Kuhn, Philip A., Soulstealers: The Chinese Sorcery Scare of 1768（叫魂：1768年中国妖术大恐慌慌）, Cambridge, Mass. : Harvard University Press, 1990, ISBN 0-674-82152-1 . Lach, Donald F.; van Kley, Edwin J., Asia in the Making of Europe, Volume III, A Century of Advance, Book Four, East Asia（欧洲形成中的亚洲（第3卷）第四册东亚）, Chicago: University of Chicago Press, 1994, ISBN 978-0-226-46734-4 . Larsen, E. S.; Numata, Tomoo, Mêng Ch'iao-fang（孟乔芳）, (编) Hummel, Arthur W. (ed. ), Eminent Chinese of the Ch'ing Period (1644–1912)（清代名人传略）, Washington: United States Government Printing Office: 572, 1943 . Li, Wai-yee, Early Qing to 1723, (编) Kang-i Sun Chang; Stephen Owen, The Cambridge History of Chinese Literature, Volume II: From 1375（劍橋中國文學史（卷下），1375年之後）, Cambridge University Press: 152–244, 2010, ISBN 978-0-521-11677-0 (2-volume set). 李治亭, 清朝通史: 順治分卷, 北京, 紫禁城出版社, 2003, ISBN 7-80047-380-5 . Mair, Victor H., Language and Ideology in the Written Popularization of the Sacred Edict, (编) Johnson, David, et al. (eds. ), Popular Culture in Late Imperial China, Berkeley and Los Angeles: University of California Press: 325–59, 1985, ISBN 0-520-06172-1 . Man-Cheong, Iona D., The Class of 1761: Examinations, State, and Elites in Eighteenth-Century China, Stanford: Stanford University Press, 2004, ISBN 0-8047-4146-8 . Mote, Frederick W., Imperial China, 900–1800, Cambridge, Mass. : Harvard University Press, 1999, ISBN 0-674-44515-5 . Naquin, Susan, Peking: Temples and City Life, 1400–1900（北京：寺廟與城市生活）, Berkeley and Los Angeles: University of California Press, 2000, ISBN 0-520-21991-0 . Oxnam, Robert B., Ruling from Horseback: Manchu Politics in the Oboi Regency, 1661–1669, Chicago and London: University of Chicago Press, 1975, ISBN 0-226-64244-5 . Perdue, Peter C., China Marches West: The Qing Conquest of Central Eurasia, Cambridge, Mass., and London, England: The Belknap Press of Harvard University Press, 2005, ISBN 0-674-01684-X . Luciano Petech, La pretesa ambasciata di Shah Jahan alla Cina, Rivista degli studi orientali, 1951, XXVI: 第124–27页 （意大利语） . Rawski, Evelyn S., The Last Emperors: A Social History of Qing Imperial Institutions（清代宫廷社会史）, Berkeley, Los Angeles, and London: University of California Press, 1998, ISBN 0-520-22837-5 . Rossabi, Morris, Muslim and Central Asian Revolts, (编) Spence, Jonathan D.; Wills, John E., Jr., From Ming to Ch'ing: Conquest, Region, and Continuity in Seventeenth-Century China, New Haven and London: Yale University Press: 167–99, 1979, ISBN 0-300-02672-2 . Roth Li, Gertraude, State Building Before 1644, (编) Peterson, Willard J. (ed. ), Cambridge History of China, Vol. 9, Part 1:The Ch'ing Dynasty to 1800, Cambridge: Cambridge University Press: 9–72, 2002, ISBN 0-521-24334-3 . Spence, Jonathan D., To Change China: Western Advisors in China, 1620–1960（改变中国:在中国的西方顾问）, Boston: Little, Brown & Company, 1969, ISBN 0-14-005528-2 . Spence, Jonathan D., The Search for Modern China（追寻现代中国）, New York: W. W. Norton & Company, 1999, ISBN 0-393-97351-4 . Spence, Jonathan D., The K'ang-hsi Reign, (编) Peterson, Willard J. (ed. ), Cambridge History of China, Vol. 9, Part 1: The Ch'ing Dynasty to 1800, Cambridge: Cambridge University Press: 120–82, 2002, ISBN 0-521-24334-3 . Standaert, Nicolas, The Interweaving of Rituals: Funerals in the Cultural Exchange Between China and Europe（礼仪的交织：明末清初中欧文化交流中的丧葬礼）, Seattle: University of Washington Press, 2008, ISBN 978-0-295-98810-8 . Вадим Тураев, О ХАРАКТЕРЕ КУПЮР В ПУБЛИКАЦИЯХ ДОКУМЕНТОВ РУССКИХ ЗЕМЛЕПРОХОДЦЕВ XVII, (编) A.R. Artemyev等, Русские первопроходцы на Дальнем Востоке в XVII — XIX вв. (Историко-археологические исследования), Hǎishēnwǎi: Rossiĭskaia akademiia nauk, Dalʹnevostochnoe otd-nie, 1995, ISBN 5744204024 . Wakeman, Frederic, Localism and Loyalism During the Ch'ing Conquest of Kiangnan: The Tragedy of Chiang-yin, (编) Frederic Wakeman, Jr., and Carolyn Grant (eds. ), Conflict and Control in Late Imperial China, Berkeley: Center of Chinese Studies, University of California, Berkeley: 43–85, 1975, ISBN 0-520-02597-0 . Wakeman, Frederic, Romantics, Stoics, and Martyrs in Seventeenth-Century China, Journal of Asian Studies, 1984, 43 (4): 631–65, JSTOR 2057148, doi:10.2307/2057148 . Wills, John E., Embassies and Illusions: Dutch and Portuguese Envoys to K'ang-hsi, 1666–1687, Cambridge (Mass.) and London: Harvard University Press, 1984, ISBN 0-674-24776-0 . Wu, Silas H. L., Passage to Power: K'ang-hsi and His Heir Apparent, 1661–1722（康熙朝储位斗争记实）, Cambridge, Mass. : Harvard University Press, 1979, ISBN 0-674-65625-3 . Zarrow, Peter, Historical Trauma: Anti-Manchuism and Memories of Atrocity in Late Qing China, History and Memory, 2004a, 16 (2): 67–107, doi:10.1353/ham.2004.0013 . Zarrow, Peter (trans. ), Qianlong's inscription on the founding of the Temple of the Happiness and Longevity of Mt Sumeru (Xumifushou miao), (编) Millward, James A., et al. (eds. ), New Qing Imperial History: The Making of Inner Asian Empire at Qing Chengde, London and New York: RoutledgeCurzon: 185–87, 2004b, ISBN 0-415-32006-2 . Zhao, Gang. Reinventing China Imperial Qing Ideology and the Rise of Modern Chinese National Identity in the Early Twentieth Century. Modern China (Sage Publications). January 2006, 32 (Number 1): 3 [2014-04-17]. JSTOR 20062627. doi:10.1177/0097700405282349. （原始内容存档 (PDF)于2014-03-25）. 周汝昌, 曹雪芹新传, 外文出版社, 1992, ISBN 9787119015491 .